Mini Split ductless air conditioners use innovative technology to heat and cool multiple spaces without the need for miles of ductwork. For more than 40 years, homeowners in Asia and Europe have enjoyed all the perks of these energy-efficient products. Today, mini split ductless air conditioners are finally winning over American homeowners too. These HVAC systems are quiet, versatile and efficient. Plus, they dramatically improve the comfort of spaces that are too hot in the summer and too cold in the winter. If your home has heating and cooling challenges, take a moment to learn about this technology and to see how a new mini split, ductless air conditioner can benefit you. What is A Mini Split? Mini split ductless air conditioners use the same technology as other HVAC systems, but there are several small yet significant differences. These modular products eliminate the need for ductwork. Instead of using one cumbersome unit to distribute heat or air conditioning throughout your home, each room or zone has its own standalone air handler. In essence, ductless HVAC systems cut out the middleman. Like conventional split systems, ductless mini split air conditioners have two main components. The compressor sits outside your home. It pressurizes the refrigerant and uses a powerful fan to exhaust heat that’s generated in the process. The air handler, which houses the low-temperature evaporator coil and fan, is located inside your home. With a ductless mini split system, these parts are linked by a thermostat wire and refrigerant line. This conduit passes through a secure 3-inch opening in an exterior wall. That’s the only structural change required. The beauty of ductless technology is that each air handler is independently controlled. Plus, the indoor equipment fits into a compact space-saving package. Some mini split AC systems provide cooling only. These models are ideal for spaces that already have central heating but would benefit from extra air conditioning in the warmer months. You can also purchase a ductless heat pump for zones that need air conditioning and heating for year-round comfort. Thanks to new technology, these products are effective in a wider range of climates, including areas that experience extreme summer heat and harsh winters. Ductless HVAC systems are available in the following configurations. Mini Splits: These systems feature one outdoor unit linked to a single indoor evaporator coil and fan. They’re designed to heat or cool one zone up to 350 square feet. Multi Splits: Thanks to an innovative feature called variable-refrigerant flow (VRF) technology, one compressor can power up to eight independently controlled air handlers across an entire building. Ductless air conditioners are extremely versatile because the indoor air handling equipment is available in numerous configurations. This gives you the option to mix and match according to the design and layout of each room. Here are a few of the most common styles. Wall-mounted air handlers are used more frequently than other options because they’re easy to install. They feature low-profile cabinet designs and are available in several finishes. The units can also be painted or wrapped to better match your décor. Floor-mounted air handlers are installed on an exterior wall closer to the floor level. They direct air upward and across the room. Since the filter and controls are at an accessible height, these units are easy to maintain. Ceiling-mounted cassettes are ideal for dropped ceilings where there’s room to conceal the air-handling components and install an access panel for maintenance. These cassettes have a built-in look. Short-run ducted units let you hide the air-handling equipment below the floor or above the ceiling. Ducts transport air to registers located up to 12 feet away from the fan and coils. These are ideal for larger spaces that require multiple return vents. 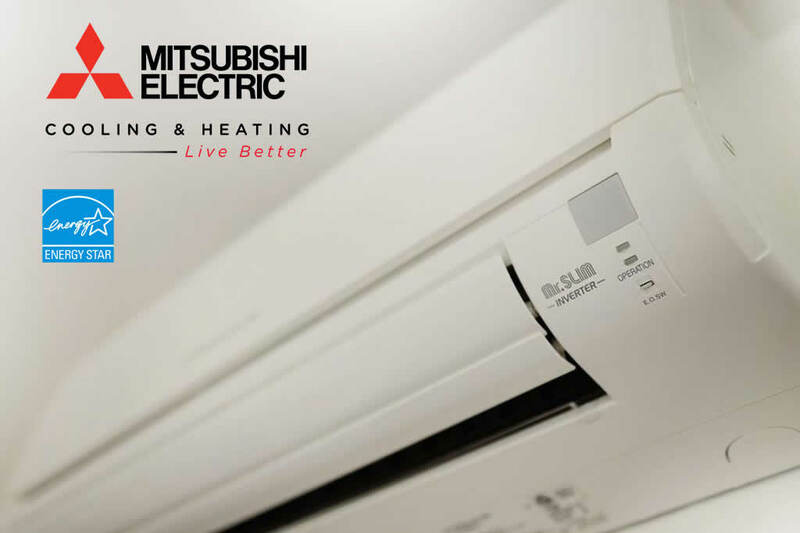 Ductless air conditioners are made by several global manufacturers, but Mitsubishi Electric Heating & Cooling is arguably the industry leader. The company opened its North American division in 1980. Two years later, Mitsubishi broke into the market with its pioneering Mr. Slim air handlers. Updated versions of this low-profile design are still in use today. In 1989, it introduced a wireless remote controller, which is now a standard feature. Mitsubishi was also one of the first companies to use inverter-driven compressors and variable-refrigerant flow (VRF) technology. These advances dramatically improve the system’s efficiency. They also allow one compressor to power multiple indoor air handlers. Currently, Mitsubishi Electric is the nation’s top ductless HVAC brand based on the number of units sold. The company manufactures a wide selection of ductless heat pumps and air conditioners that deliver efficient heating and cooling. Its catalog includes more than 30 Energy Star-certified products with efficiency levels as high as 33 SEER for cooling and 13 HSPF for heating. During Mitsubishi’s 40-year history, it’s been the first to release many new and exciting advances that have become industry standards. Today, the company’s HVAC systems are equipped with the following high-tech features. 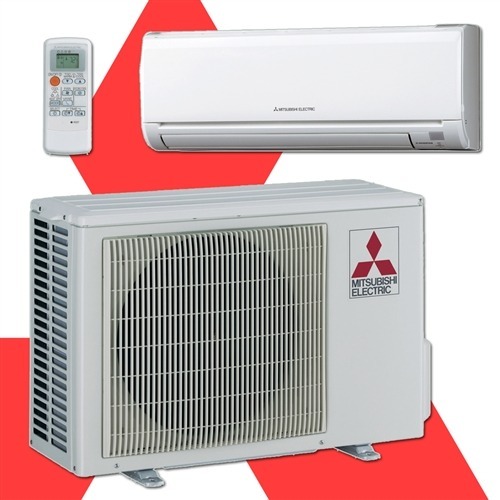 Unlike other heat pumps that struggle when the temperatures fall below freezing, Mitsubishi’s products feature specially designed compressors that perform optimally in temperatures as low as 13 degrees below zero. The duct-free design eliminates the uncomfortable cold blast associated with other forced-air heating systems. Hot-start technology prevents chilly drafts by giving the system time to warm up before the fan starts. Infrared sensors allow your ductless system to scan the room for temperature changes and to deliver heating or cooling exactly where it’s needed. Remote devices help the system monitor its output for optimized comfort. Wireless controls let you adjust the temperature or fan speed using your smartphone even if you’re away from home. Most systems are compatible with climate-control apps and third-party home automation networks. Manufacturers like Mitsubishi are eager to show customers that they provide added value. Most systems include generous warranties that cover all major components for up to 12 years. Mitsubishi HVAC systems are installed by a network of independent Diamond Contractors that the company has recruited since the 1990s. Qualified installers have specialized tools and in-depth knowledge that helps new equipment perform optimally. There’s no other way to say it. Ductless HVAC equipment costs more. The exact price varies widely since a mini split can heat and cool one room or an entire home. Here are a few tips for weighing your options and estimating the potential cost. As a rule of thumb, mini splits cost between $1,500 and $2,000 per ton according to current estimates from the Department of Energy. Most residential systems are between three-quarters of a ton and 4 tons. This makes them about 30 percent more expensive than conventional ducted models. It’s important to note that this estimate doesn’t include the cost of running new ductwork. In existing buildings, that process can be messy, noisy and time consuming. Sometimes, it’s just not practical or cost effective. On the other hand, ductless installations are exceptionally convenient. Most are completed in one day. If you’re retrofitting an existing home, the ease of the installation may help to offset the slightly higher equipment cost. Because ductless air conditioners are so efficient and don’t suffer from duct-related energy losses, you’ll recoup your investment faster. Compared to conventional air conditioners, ductless systems can cool a larger area, so your contractor may recommend a slightly smaller unit. This can help to level the cost difference as well. Ductless systems cost twice as much as window air conditioners, but there are several clear benefits. Here are a few reasons why ductless is the better option. You don’t have to give up a window or dedicate floor space to accommodate a portable AC unit. Ductless units are secure and efficient. Because they use a weatherproof 3-inch portal to connect the components, there’s no way for an intruder to enter. A ductless system is more practical than multiple window air conditioners. In addition to downsizing your monthly heating and cooling bills, an Energy Star-certified ductless air conditioner may qualify for utility rebates or tax credits. These incentives could lower your initial investment by up to $1,000. Use Energy Star’s rebate finder to locate offers that are available in your area, or ask your local utility company for information about their rebate program. You may also qualify for manufacturer-sponsored promotions or factory financing offers that can substantially lower your out-of-pocket expenses. 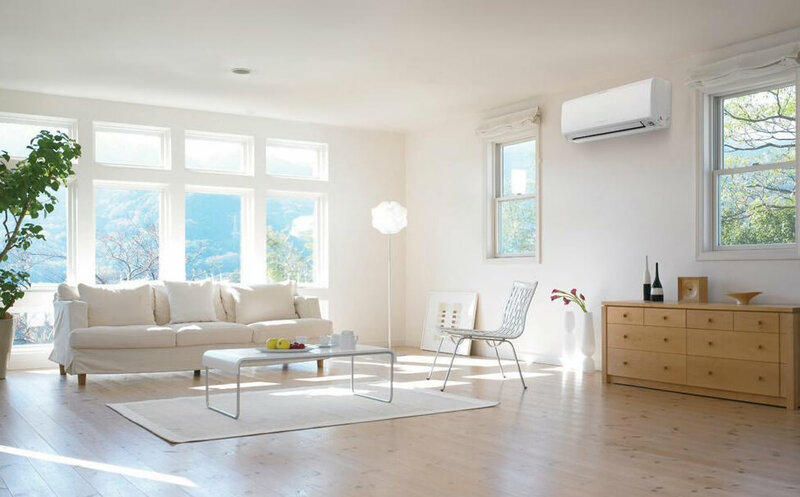 Ductless HVAC equipment is ideal for new and existing homes. If you have a blazing hot sunroom, an unbearable garage or an attic hobby room where you’re never comfortable, a ductless system could solve your heating and cooling problems. These products excel in the following applications. Existing Homes: For historic homes that aren’t equipped with central HVAC equipment, a ductless air conditioner lets you update your property without making major structural changes. Temperature-Challenged Spaces: According to the American Home Comfort Study, 67 percent of respondents said that they have at least one temperature-challenged room. Mini split AC systems eliminate hot and cold spots to make stuffy bedrooms and chilly living rooms more comfortable. Additions and Renovations: If you’re converting an attic, building a workshop in your garage or installing a sunroom, ductless heat pumps let you add heating and cooling without modifying your existing HVAC system. New Constructions: Ductless air conditioners improve the efficiency of new homes. They’re especially useful for green constructions, trendy tiny homes and custom buildings in areas with high energy costs. Multi-Family Buildings: Thanks to their modular configuration, ductless air conditioners are ideal for multi-family dwellings. The installation is faster, and each resident controls the temperature for their living space. Are Ductless Air Conditioners Noisy? Ductless air conditioners are surprisingly quiet. Indoor air handlers operate at just 19 decibels when the lowest fan setting is selected. Variable-speed outdoor compressors run at 58 decibels, which is about as loud as a lively conversation with friends. Comparable single-stage central air conditioners operate between 72 and 76 decibels on average. Another advantage of ductless equipment is that the air handlers can be located up to 50 feet away from the outdoor unit. This gives you the option to heat and cool your garage as well as the sunroom on the other side of your house. It also lets your contractor position the compressor where its operating noise will be less noticeable. Due to their energy-saving technology, ductless mini splits are quieter and more efficient at startup. They also eliminate the rattling, whistling and clanging associated with ducted HVAC systems. Most systems feature vibration dampeners and insulating sound blankets that further reduce operating noise. Ductless heating and cooling systems have numerous advantages. Take a look at some of the most popular reasons why homeowners choose ductless technology over other options. Energy Efficiency: According to Energy Star, ductless cooling systems are 30 percent more efficient than portable room air conditioners. Ductless heat pumps are 60 percent more efficient than radiant electric-resistance systems. Variable-Speed Technology: Thanks to computer-controlled inverters, ductless HVAC products modulate depending on how much heating or cooling is needed in each zone. This minimizes temperature swings and saves energy. Comfort: Because each air handler is independently controlled, you can adjust the temperature and fan speed in each zone to improve your comfort and reduce your energy use. According to home improvement guru Matt Risinger, mini splits provide a level of personalized comfort that most Americans have never enjoyed. Air Quality: Central air ducts affect your home’s indoor air quality by becoming a breeding ground for allergens. With a ductless system, there’s nowhere for dust or pollen to hide. Plus, each air handler features a washable multi-stage air filter that traps contaminants. Operating Noise: Ductless air conditioners are exceptionally quiet. If you’re a light sleeper, you can adjust the fan speed to create a calm environment. Outdoor equipment can be positioned away from your living areas to reduce noise as well. Installation: Most installations are completed in a single day. According to the experts at This Old House, it takes a factory-authorized contractor approximately four hours to install a single wall-mounted unit and compressor. It takes roughly two hours for each additional air handler depending on the complexity of the install. Versatility: Ductless air handlers are available in multiple configurations depending on the layout of the room and your available space. You can choose from units that mount to the ceiling, wall or floor as well as products with short-distance ducts that work well in nearly any home. Ductless air conditioners give you more control over your comfort when compared to any other option, including central cooling systems. If you’re interested in learning more, call us today! 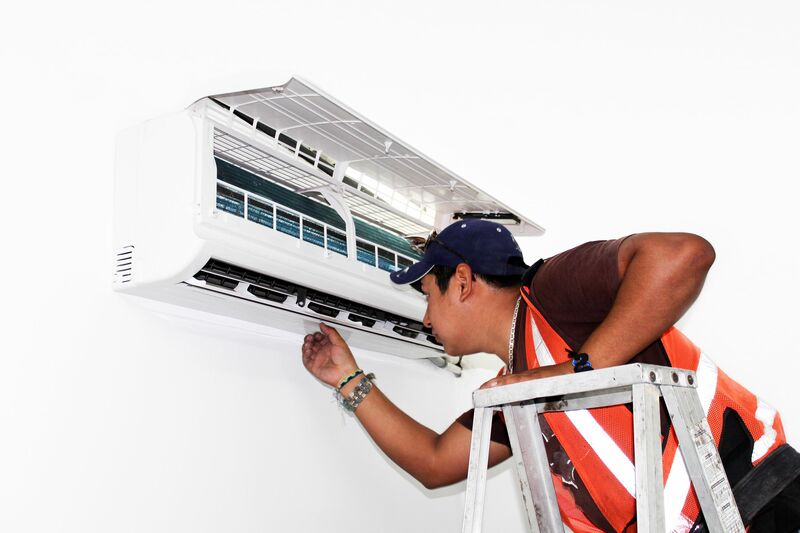 Penguin Cooling & Heating is the Charlotte, NC expert in ductless air conditioning systems, and we will show you the options that fit your budget, and your desired climate, as well! We would love to help you today!